Saturday's try-scorer Gareth Davies will continue his half-back partnership with man-of-the-match Dan Biggar. Anscombe does not figure with head coach Warren Gatland saying he was "not 100%". Wales' pack remains unchanged and back-rowers Dan Lydiate and Taulupe Faletau will win their 50th caps. 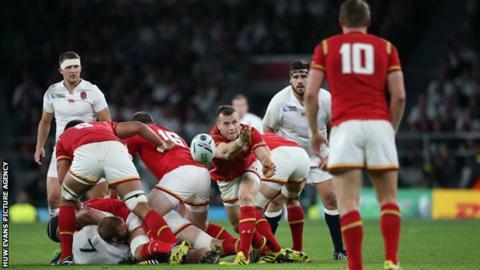 "We have made three changes through injury but go into this game with a strong side," Gatland said. "It is important we build on the success and momentum from last weekend and take that into Thursday." Bristol's Matthew Morgan and Newport Gwent Dragons' Tyler Morgan, who was called into the squad as a replacement for the injured Cory Allen, will make their first starts of the tournament. If Wales, who are second in Pool A behind Australia, beat Fiji they will top the group. England, in third, play the Wallabies on Saturday. Although Fiji have lost their opening two games to England and Australia, the Pacific Islanders caused problems for their rivals and remain a powerful side. "Fiji have performed very well in their opening two games and they will be coming to Cardiff looking to build on that themselves," Gatland added.